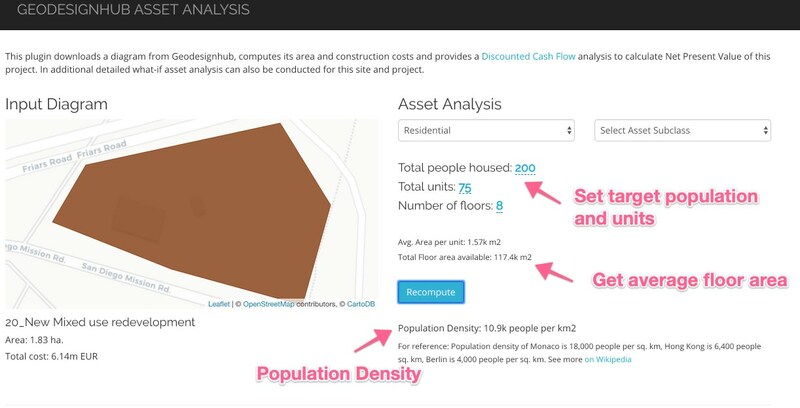 This plugin enables multi-scale geodesign, it has two distinct parts: Asset Analysis and Investment Visualization. It uses the Geodesign Hub API to download the diagram and systems data and then provides a series of controls to analyze and set potential uses of this asset and finally conduct a investment analysis. 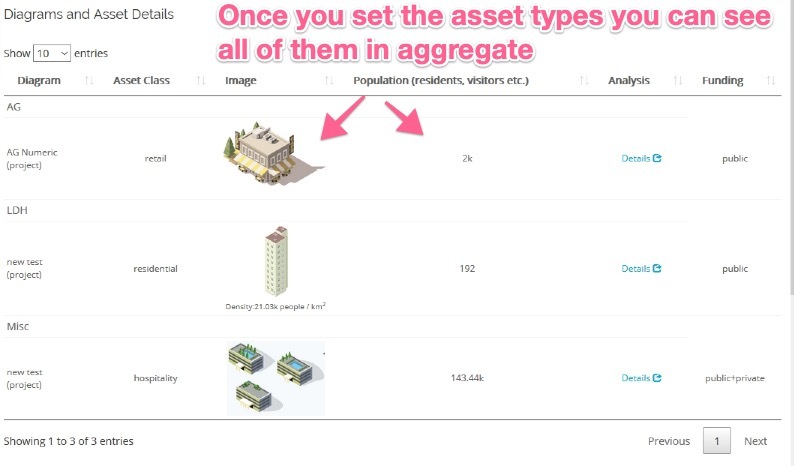 Using this library you can set specific characteristics of a diagram such as people housed, total units and number of floors for a example for a residential diagram, as shown below. 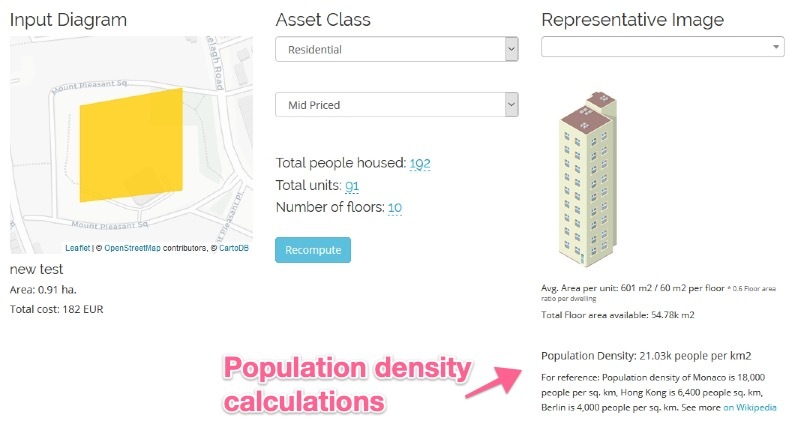 In addition you can set a representative image and compute targetted population density. There are other asset types as well such as Tourism, Office, Retail etc. As we progress, we will continue to add additional asset classes. Once you have set the housing requirements, you can then look at capital investment and a ROI on that investment. 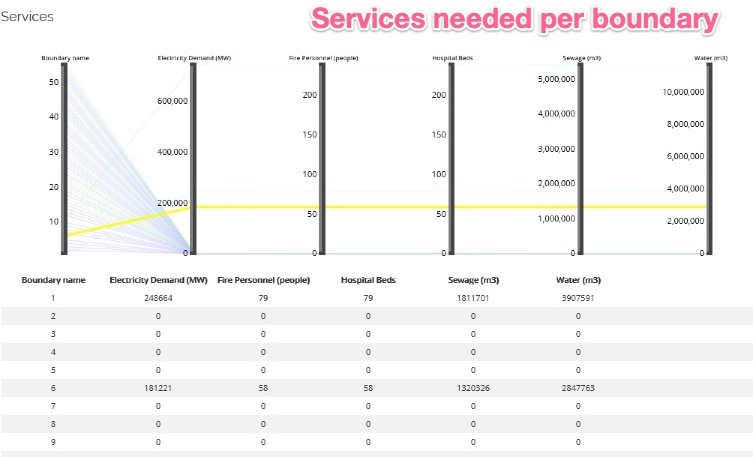 Finally you can then compute the services requried for that asset to understand the implications of putting a asset like that in the space. This is the second part of the plugin. 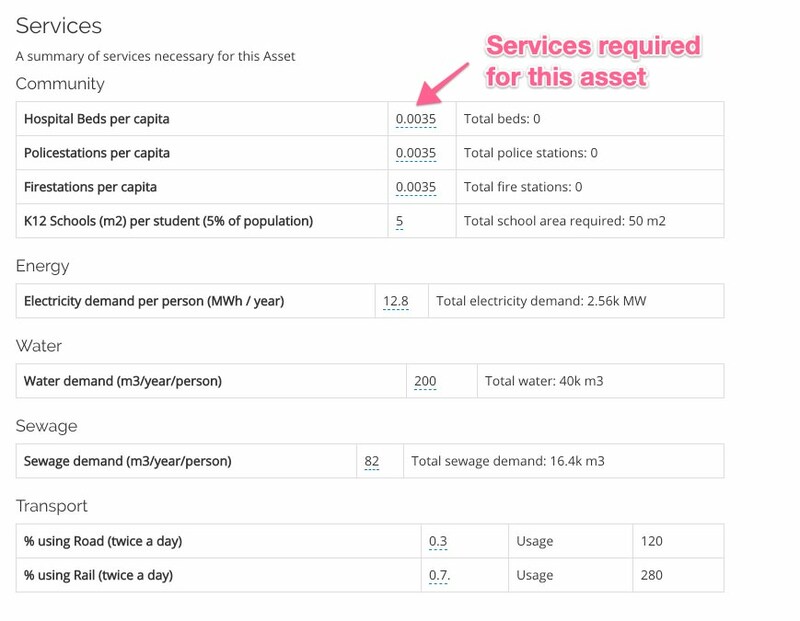 Once you have set the asset details per asset, you can then do very interesting analysis of the interventions both financial and temporal as detailed below. The library analyzes the location of the diagram over the boundary uploaded into Geodesignhub. A boundary is a simple polygon file that can be really any boundary: social, political, economic or administrative. Once the boundary is uploaded, the plugin computes the asset details over that boundary. 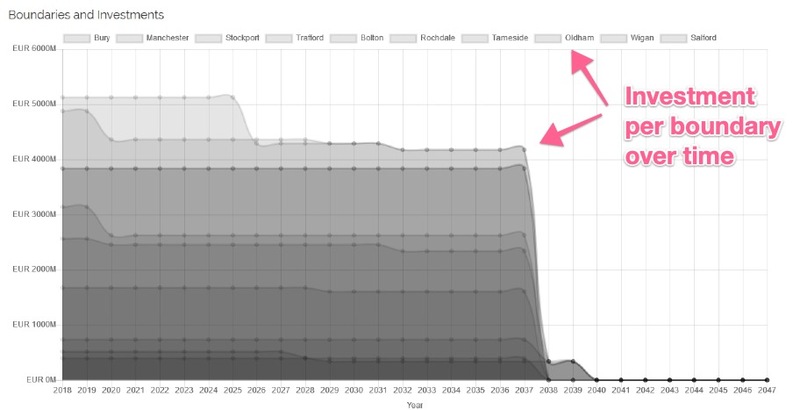 This is useful to visualize how money flows in the design over time and space. 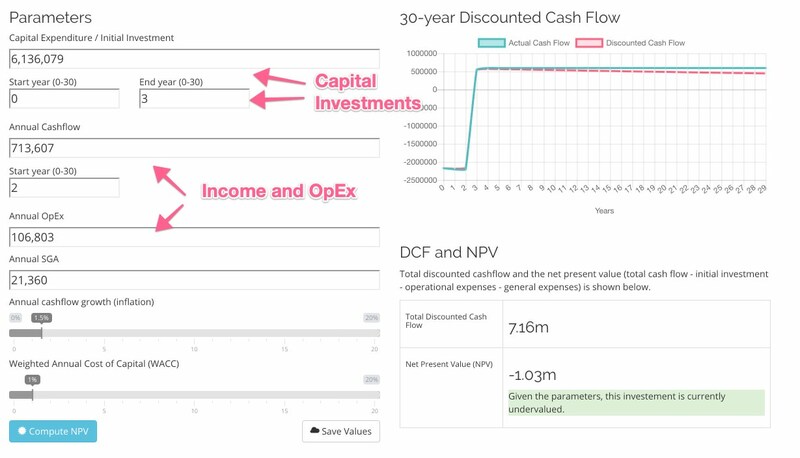 Investment over time per boundary, once the capital investment is set, you can then compute how the investment flows over different boundaries. Below is a chorpleth intensity map of investments demonstrating the across various boundaries. Also as a simple chart. Once intervention strategy is finalized, all the asset details “rolled up” in one list with all the totals. 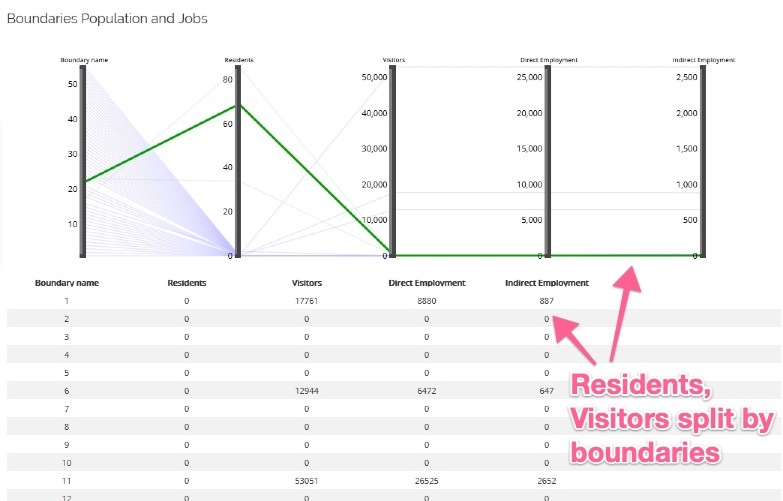 The plugin splits the allocations proportionally across different boundaries so you can see how the distribution of jobs, visitors, population and services are split across the different boundaries. The plugin can be added to your project using the Administration panel.